Hiiii friends!! I am so excited to share the reveal of our kitchen renovation. This has been a labor of love. 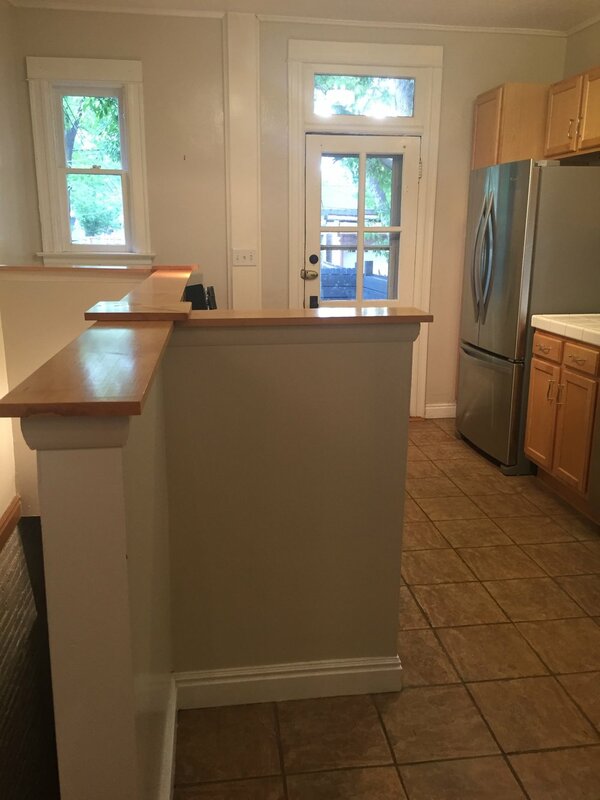 We hired a contractor to oversee and do the majority of the work and we finished off the kitchen ourselves with painting and some finishing details. I will post a few more detailed posts in the coming weeks about specifics, favorite features, and recommendations we have for the whole process. But for now we are just thankful the kitchen is complete and functional again! Also the sunlight in Denver is something else. It comes in from every angle in our house! Leave any questions you have below and I would be happy to help answer any of them! We purchased the IKEA Kitchen Planning Services during a promotional period that stated if we moved forward with purchasing the kitchen from IKEA we would get this cost taken off of our kitchen total (cabinets + hardware + counter top). So in short, if you are serious about re-doing your kitchen then this service is essentially free. One clarification that I discovered is that you can pay for 1) IKEA Kitchen Planning Services ($199) or 2) Measurement Service ($49), but option #1 comes with the measurement services already included. The measurement service is handy because you need to know very specific measurements related to your kitchen and I thought the Planning Tool was kind of confusing so I was relieved this was all included. One slightly inconvenient part about scheduling your IKEA Kitchen Planning Service appointment is that you actually have to go into the store to schedule it and pay for the service at that time. We drove out to the Centennial, CO store on a Friday evening because there is essentially no one there! I have to admit I have never and don't plan on going to an IKEA on a Saturday! It is just too crowded for me. Plus I think my husband would have a heart attack if I made him do this. Night time week shopping is much better for us. The appointments are in 4 hour windows and are only available on weekdays, Monday-Friday. We were able to schedule ours for the following week with plenty of availability. You have two time frame options, 9 am to 1 pm or 2 pm to 6 pm. So in short you pretty much have to take a half day off of work if you work a "normal 9-5 job". We chose to do the 9 am to 1 pm slot. We were already taking the day off for a vacation so we thought why not try to cram one more thing into the day! Before we made our appointment, you will fill out an informational sheet with the door fronts you want, hardware, counters, etc. This makes your appointment go much faster! Plus you are already in the store so you can see everything first hand before making a decision. IKEA Kitchen Designers are actually employees of IKEA's national contractor, Traemond, or one of their local subcontractors. Our local subcontractor is the company Styrka Construction. These designers are under a corporate umbrella which made us feel more comfortable about the whole process. On top of that, the designer's main job is planning and designing IKEA kitchens specifically and managing the process of installation with their company. In short, they are experienced at what they do. Our designer, we will call him Jake, called on his way to our house to let us know he had some car trouble and was running a few minutes late to our appointment. However, we have a very small kitchen and knew that we would not need all of the time allotment. In addition, we had a hard stop at noon but our designer assured us he would be able to design the kitchen in the time we still had left. He was absolutely correct. After speaking with him for a few minutes about some of our wish list items, he got to work. In the time he was at our house he measured our kitchen, input it into the IKEA Kitchen Planning Tool, and designed all of the cabinets within the IKEA Kitchen Planning Tool. We basically all sat at the kitchen table while Jake worked. Ben and I looked at various things on our computer (just so it wasn't so awkward) and every few minutes Jake would ask us a question as he designed. He essentially planned the entire kitchen with our input. Jake was a whiz at the IKEA Kitchen Planning Tool, thank goodness. The software is good but kind of clunky and hard to navigate if you are not in there all the time. This was easily the best part of the whole design services appointment. We then reviewed the design and were able to make any changes or suggestions that we wanted to with Jake. He also created a quote to actually do the entire install while also on site on his computer. As we have had issues with promptness of other contractors we were impressed by this. After the designer leaves, they will email you a link to your IKEA Kitchen Plan. However, this link will expire in 5 days if you don't login and save it to your own IKEA Kitchen Planning Tool account. Very important to remember this. Within 2 days of him leaving we had our kitchen design in our IKEA Kitchen Planning Tool portal, our item purchase list (what you take directly to IKEA to place your order), and a full quote for just the install. I will explain more about what comes with the installation service in a future post. We decided to have them manage the entire project so we still had to schedule an appointment with their general contractor to come over and bid out what it would cost for demo, prep, electrical, plumping, back splash, etc. Overall we really enjoyed our IKEA Kitchen Planning Service experience. We had to poke our designer a few times regarding connecting us with the general contractor and sending us our pricing list but he was always responsive and easy to work with! If you are serious or remotely serious about getting an IKEA Kitchen then I think this service is essential. I really do. I wouldn't waste time with the hassle of trying to work on the system yourself, it isn't that easy and they are trained on it! Also - the stores are always so busy so having someone's full undivided attention in your home is really great! Something to keep in mind, the designer is actually helping with the layout of the kitchen, how many drawers you want, what size, etc. with the assumption you already know what style of cabinets and hardware you want. What you see in the design is what is ordered exactly. So make sure you love the design before they leave! One side note: I originally had our kitchen designed in the grey Bodbyn and then when we went to purchase it we changed to white. The sales clerk was easily able to change this on our order. I will post more about the IKEA cabinet purchasing process soon! This entire kitchen renovation process is very long but easily manageable once you have all the information you need. IKEA and Styrka were great about providing us the information we needed to move forward. There are no affiliate links in this post. I was not compensated to review this service. My review is for educational and informational purposes only!